If you've never tried za'atar before, then you need to go to a Middle Eastern store in your area or order it online and try it. Do that before you ask me why. The last time I had junk pizza was during my freshman year in college. We were hanging out in the dorms and as any typical school, we had a pizza party. The pizza smelled SO good at that time so I decided to have a piece (I wasn't vegan at the time) and the second I took a bite I was so disappointed as the smell didn't match the taste. It was so gross I couldn't even finish it. Oh, and it didn't end there, but I'm gonna spare you what happened after. I know that a lot of people feel bad for me at pizza parties or similar gatherings because I'm "missing out" on whatever junk food is at presence. And on the other hand, I feel bad for them. I wish everyone could realize that you can eat delicious food that won't make you feel like crap and without harming any animals or the planet. Any veggies your heart desires. Tip: saute or roast them for a bit before topping them on the pizza. Dough:, mix everything in a stand mixer (or with your hands for a good arm workout) until the dough is somewhat sticky. About 7 minutes. Form into two balls then cover and let it rise for one hour. Tomato sauce: saute the onions then the garlic in a little bit of water then add the seasonings then the tomatoes. Let it cook for about 10 minutes. 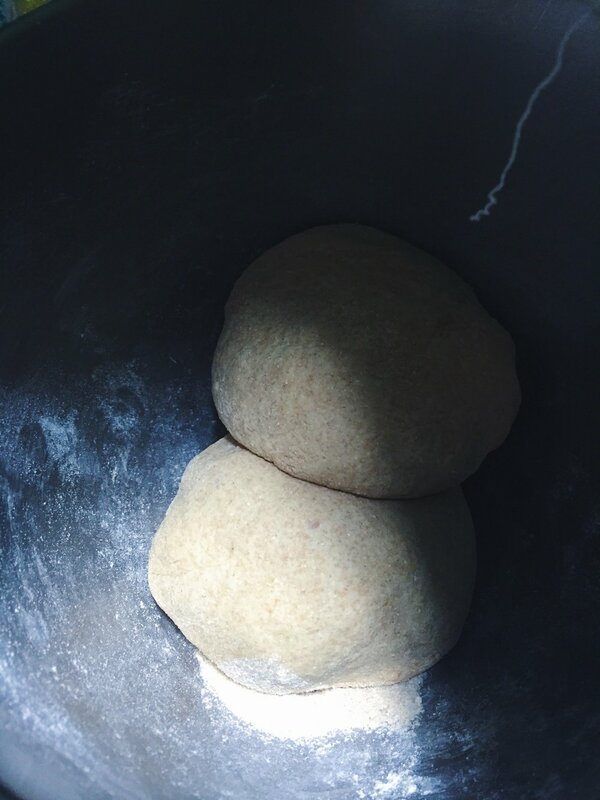 Roll out the dough and use extra flour so it doesn't stick to the surface or your hands. You want it to be somewhat thin. Now start making the cheese. Mix everything in a food processor or a blender. It'll be very watery but don't worry. Heat a non-stick skillet on low-medium heat, add the cashew mixture and keep stirring constantly as it thickens. Top your pizza with the tomato sauce, veggies if using, then add the cheese while it's hot and stretchy. Za'atar pizza: add a generous amount of tomato sauce, but a thin layer of za'atar, otherwise it'll be too bitter. Broil for 1 minutes or less while keeping a close eye on it. Leftovers: preheat the oven to 350F and place the pizza on the second to last shelf. When your oven is heated to 350F then your pizza will be all warmed up.